St. John’s Episcopal Church set forth to remodel their basement classrooms. Doing this required the installation of a new Handicap ADA ramp from street level down to the basement. 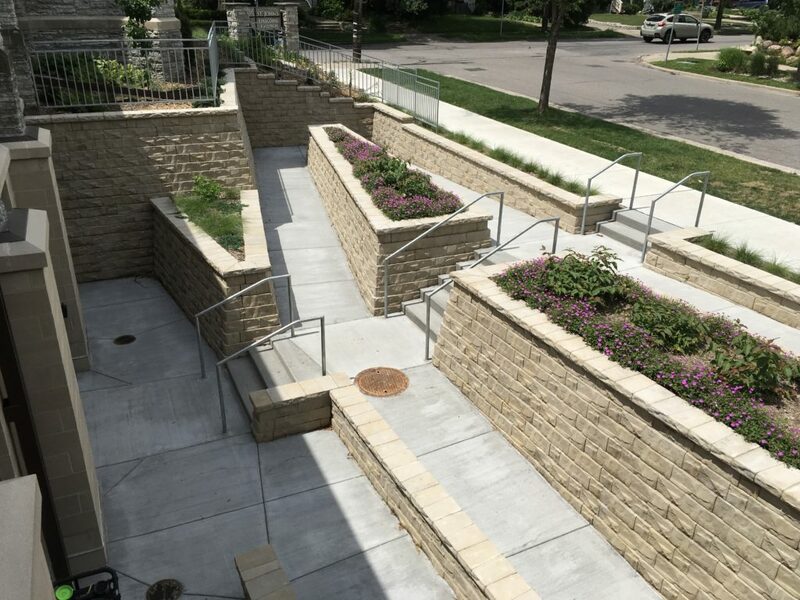 The Architect used Anchor Brisa retaining wall units to hold back grade for the ADA ramps. Anchor Brisa Moonlight color was selected to save on the cost of natural stone while maintaining a similar rock-faced look as the existing building. There was very limited space between the street and the building to create the ramp at the regulated ADA grade. This required quality craftsmanship in saw cutting the angles for the retaining walls to create the landing areas on the ramp. Also, strong attention was made to the layout of the retaining walls as many factors went into leveling the base to maintain the proper block wall pattern exposed above grade. With the size of the retaining walls, and limited space to backfill, over half the walls were backfilled with no-fines concrete to cut out the use of geogrid reinforcement. This was a porous concrete that allowed water to drain freely while still acting as concrete and increasing the structural integrity of the walls without the need for long geogrids. 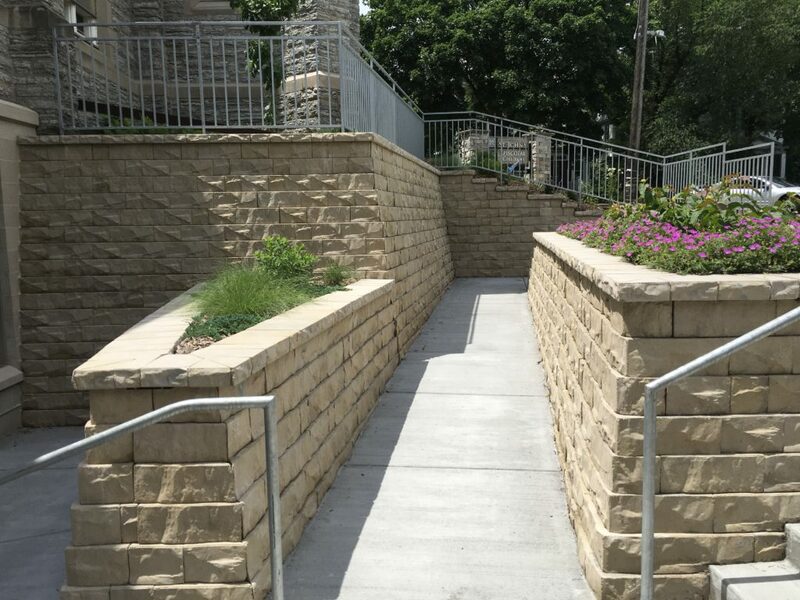 Above the retaining walls, freestanding blocks were needed as the back of the blocks were exposed along the stairs and many parts of the planting beds. A homemade “Snipe-Bucket” was used to carry the no-fines concrete over the site and reach into tough places to backfill the walls. 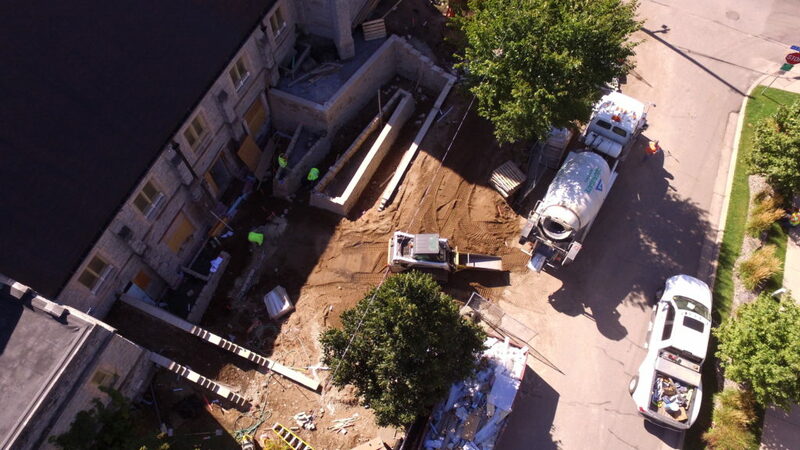 Each wall was constructed in a sequence that timed out with the concrete delivery schedule, so no backfill went to waste. 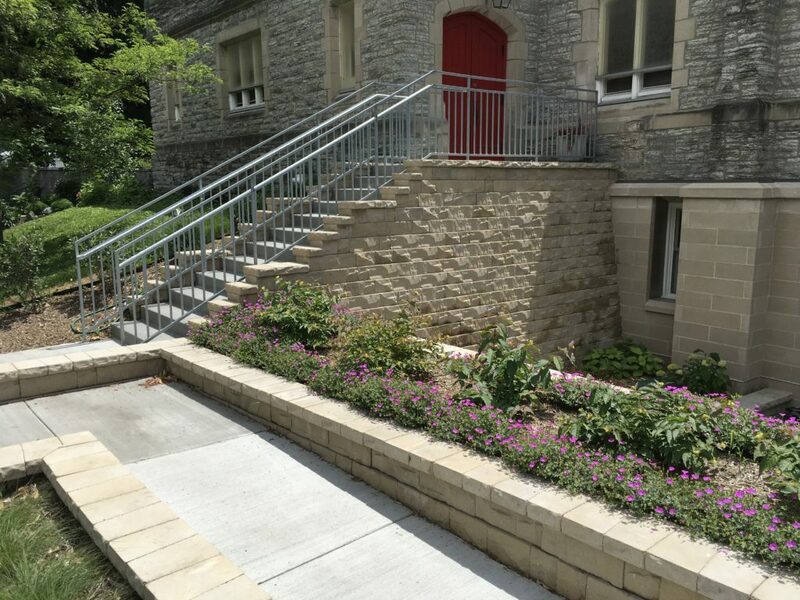 Overall the project was a large success adding a functional ADA ramp to the basement of the church with structural retaining walls while not holding back on quality and aesthetics. The church’s renovation is a beautiful addition to the high-end residential neighborhood on Sheridan Ave in Minneapolis!